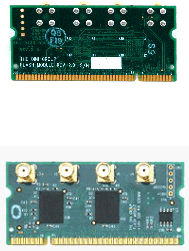 The DNSODM200_FLASH is a SODIMM module that can be installed in a 200-pin DDR2 SODIMM socket. This module contains two Spansion™ Flash chips (S71WS128NB0BFWAN0-LF) in a 8M x 32 configuration for a total of 32 megabytes of FLASH memory. SSRAM (2M x 32) is also provided on the same address/data pins via a separate chip select. All FLASH and SSRAM functions of the S71WS128NB0BFWAN0-LF are available, including burst read at 66MHz, secured sectors, 64 customer-lockable words, and 64 factory-lockable words. Up to 1 million sectors erase cycles are guaranteed. The DNSODM200_FLASH is compatible with all Dini Group products equipped with DDR2-SODIMM sockets. Reference designs in both verilog and VHDL are provided.